Think Burrus Blog: Can you Reduce your Soybean Planting Population? University research has shown many times that it can be done, but yet, some growers are still uneasy. With today’s farm economy, I am getting asked about reducing soybean planting populations quite frequently. We usually start with a soybean planting populations of around 140,000 seeds per acre for 30 inch rows, but this will increase with narrow row spacing. For more information, check out information at Soybean Production in Missouri. You can start to decrease soybean population if you have excellent seed quality, seed treatment, pre and post residual herbicides, and ideal planting conditions. A target should be around 100,000 plants per acre as a final stand, and in some situations, you can get away with lower stands, without replant, if stands are consistent across the field. *No significant yield differences in 100K, 125K, and 150K planting populations. In 2015 Burrus Dealer, Pete Gill offered Burrus the use of 3 soybean plots to evaluate seed treatments and plant populations. Each of small plots were around 200 x 300 feet in size and located within cornfields, so the planting date remained the same on May 18th, 2015 and only received a post application of glyphosate. 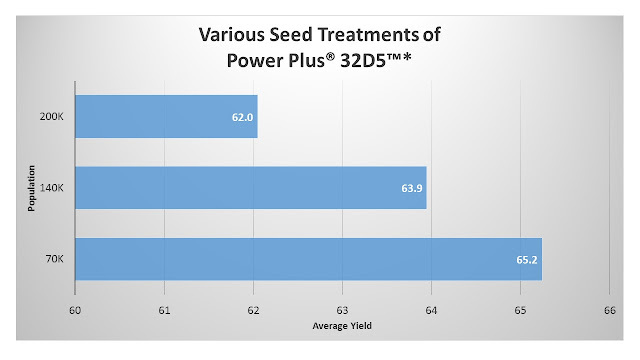 Each of plots were planted with 3 replications (6 row strips) of 3 different seed treatment mixes as well as untreated of the soybean variety PowerPlus® 32D5™*. Each of the plots consisted of a different soybean population: 70,000 140,000, and 200,000 seeds/acre. There was light weed pressure and possible residue issues that could have increased variability within these plots. Disease pressure was light. Every year will be different, but, recently weed and disease pressure have some growers spending additional input cost towards residual herbicides and “game changer” seed treatments such as PS SDS (PowerShield® + ILeVO®), to gain cleaner fields and insurance against disease. With this added peace of mind, could we lower input costs by reducing seed costs? The answer is yes.